A review-essay on Marked for Death: Islam’s War Against the West and Me, by Geert Wilders, Regnery Publishing, May1, 2012, 256 pp. Both part1 and part 2 are now posted at The American Thinker, and the full essay is reproduced, below. The Amsterdam Rijksmuseum’s current exhibit “Ottomania” punctuates ongoing commemorations marking 400 years of Dutch-Turkish relations. With depressing predictability, the Turkish media erupted in fury over a 1683 print on display which celebrates the defeat of the Ottoman jihad campaign against Vienna. 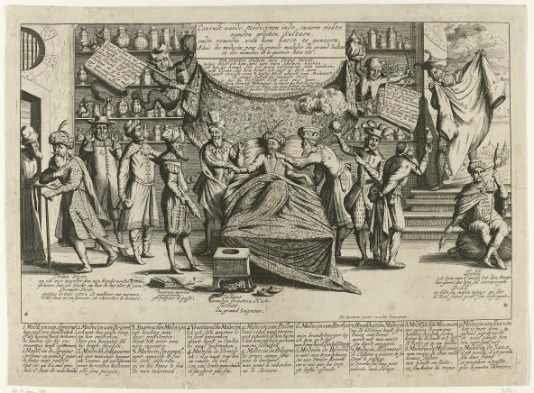 Consistent with disparaging images commonplace in that late 17th century era, the print depicts Mehmed IV, the Ottoman sultan (r. 1648-1687), lying forlorn in bed following the humiliating defeat of his grand vizier Merzifonlu Kara Mustafa Pasha at Vienna. A salient detail of the print shows the royal bedside commode adjacent to a Koran, placed, ostensibly, for use as toilet paper. Gul’s Islamic regime and his party colleague, Turkish Prime Minister Erdogan, are no friends of the West and therefore not of the Netherlands either. President Gul is not welcome. Turkey has no place in the community of European values and there’s no reason for a party. Anyone who looks further than their own nose can see that the regime of Gul and Erdogan is killing off Turkey’s secular constitution in order to re-Islamise the country. On August 28, 2007, the same day that Abdullah Gul became Turkey’s President – replacing his secular predecessor, and further consolidating the ruling Islamic Adalet ve Kalkınma Party’s (AKP’s) hold on power — MEMRI published excerpts from a chilling, virulently Jew-hating interview given by Gul’s and Prime Minister Erdogan’s mentor, the late (d. February, 2011) former Turkish Prime Minister Necmettin Erbakan. The interview originally aired July 1, 2007, as part of Erbakan’s campaign efforts in support of Islamic fundamentalist political causes before the general elections of July 22, 2007, and the AKP’s resounding popular electoral victory over its closest “secularist” rival parties. Erbakan, founder of the fundamentalist Islamic Milli Gorus (National Vision; originated 1969) movement, mentored current AKP leaders President Gul, and Prime Minister Erdogan, both of whom were previously active members of Erbakan’s assorted fundamentalist political parties, serving in mayoral, ministerial, and parliamentary posts. The modern fundamentalist Islamic movement Erbakan founded has continued to produce the most vile strain of antisemitism extant in Turkey, and traditional Islamic motifs, i.e., frequent quotations from the Koran and Hadith, remain central to this hatred, nurtured by early Islam’s basic animus towards Judaism. Indeed, the shared overall Weltanschauung of Erbakan, and his mentees Gul and Erdogan, is characterized by Jew and other non-Muslim infidel hatred, accompanied by rejection of Western Judaeo-Christian and Enlightenment values, and the revitalization of an aggressive, Neo-Ottoman, Sharia-based Islam in Turkey. Their collective movement’s “success”—the apotheosis of an Islamic fundamentalist revival fully evident within a decade of secular autocrat Kemal Ataturk’s 1938 death—can be gauged, notably, via the findings from a lengthy U.S. Commission on International Religious Freedom (USCIRF) report issued March, 2012. Every year that passes without substantial religious reform places these minorities in greater peril and helps seal their fate. In the Arab Spring, Turkey holds itself out to be an Islamist model. But it is no model for religious freedom. We have waited for ten years for the AKP to make a real difference in the Christians‘ fate. We can no longer sit by and just ―Watch. The whole of Europe will become Islamic. Like the army of the sultan we will conquer Rome. Subsequently, Prime Minister Erdogan, on two occasions within the past four years (in 2008 and 2011), while speaking to the very large Turkish expatriate community in Germany—though less blatantly chauvinistic than his mentor Erbakan—has rejected the idea that Muslim Turks assimilate within Germany’s non-Islamic society. What is the explanation for this cognitive dissonance displayed by Dutch political and media elites—their simultaneous groveling obeisance to Gul’s Islamic supremacism, and vitriolic denunciation of fellow countryman and political leader Geert Wilders? These cowardly, self-flagellating reactions are pathognomonic of Western Europe’s deliberate sociopolitical transmogrification over the past four decades, processes historian Bat Ye’or has described in painstaking detail: the morphing of Europe into “Eurabia,” a cultural and political appendage of the Muslim world. Eurabia’s advent and continued all encompassing development explains the myriad personal travails Wilders elaborates in Marked for Death. Reflecting an insidious aspect of the jihad to which al-Tohami alluded, i.e., cultural jihadism, the Euro-Arab Dialogue introduced the educational and cultural programs of European Islamic Centers into European schools. …in the waning years of our 20th century… there might be a danger of a recurrence, in the immediate future, by other modalities, of the upheaval provoked more than a thousand years ago by Islamic penetration of our continent. German Islamologist Karl Binswanger’s 1977 study Investigations on the Status of Non-Muslims in the Ottoman Empire of the 16th Century, With a New Definition of the Concept “Dhimma”, was a pioneering examination of dhimmitude under Ottoman rule. Subsequently, he analyzed Islamic fundamentalism in Iran, Syria, and within Germany itself. Binswanger then demonstrates how the strident re-affirmation of Islamic identity within Germany’s Turkish immigrant population engendered, “…an increasingly intense demonization of the culture, legal and social order of the host society: the image of Germans as enemies.” Central to this disturbing process was the inculcation of validating Islamic (i.e., Koranic) motifs which promote hostility to non-Muslims. Arguably the most accomplished (and easily the most unapologetic) scholar of how the Ottoman Turks progressively imposed the Sharia on non-Muslims, Binswanger became alarmed by the obvious modern parallels to that phenomenon he observed in the behaviors of their contemporary Turkish descendants in Germany. I can only rejoice in this action, because it shows that no matter who you are, you can’t say whatever you want with regard to a book as universal and sacred as the Koran. At a news conference, Barreau defended his book and called his firing “a mistake.” He maintained “pressure from Arab and Muslim embassies was the determining factor” in his dismissal. Barreau concluded, appositely, that the action taken against him demonstrated intellectuals were forbidden to question Islam. It is possible for a top civil servant to doubt the divinity of Jesus Christ, but it is forbidden to ask questions about the prophet Mohammed. To re-launch the Euro-Arab Dialogue in conformity with new strategic perspectives in order to constitute the future bilateral pole of international equilibrium and to participate in the creation of a new world order. Two decades after the 1991 Barreau affair, Dutch Parliamentarian Geert Wilders has emerged as a bold, highly informed populist challenger to the deeply entrenched Eurabian establishment and its malign, dystopian paradigm. Not surprisingly, as chronicled in Marked for Death, Wilders thoughtful, outspoken criticism of the entire Eurabian “project” has been met with ceaseless vituperative attacks on him by establishment media and political opponents, perverse state legal efforts against his free speech rights, and multiple death threats, which mandate constant, intensive, well-nigh self-incarcerating personal security precautions. Geert Wilders was born September 6, 1963, in Venlo, a town in the Netherlands’ southernmost province of Limburg. As a youth, Wilders considered himself “one of the 15% of Limburgians classified as non-religious” (citing 2003 census data indicating 78% of Limburg’s residents were Catholic, 2% Protestant, 5% non-Christian religious, and 15% non-religious). Wilders acknowledges that his youthful “atheist radicalism” matured into a humble agnosticism, imbued with Friedrich Hayek’s understanding of God as the “personification of that tradition of morals or values that keeps their community alive.” Although not raised in a political family, Wilders’ father aided the anti-Nazi Dutch resistance during World War II, and was very pro-American—attitudes which have strongly influenced the Dutch Parliamentarian. Wilders’ own anti-totalitarian Weltanschauung highlights the striking similarity between non-religious ideocratic and religious theocratic totalitarianism—the latter epitomized by Islam. Ideocratic states like Nazi Germany are ruled by governments whose legitimacy is grounded in claims to be the guardian of morality and truth. Anyone who opposes such a state is considered to be an enemy of the truth, a vessel of immorality and falsehood who deserves to be silenced. This explains why such states—whether revolutionary France, the Soviet Union, or Nazi Germany—exterminated their perceived enemies with guillotines, gulags, or gas chambers. There is no fundamental difference between ideocratic states and theocratic states, because the totalitarian impulse erases the difference between state and religion. A state can use religion to enforce draconian social control, such as in Iran or Saudi Arabia today, or it can be totalitarian absent a religious framework, such s the Soviet Union and Nazi Germany. Wilders further distinguishes between these secular or Islamic totalitarian societies, and the non-theocratic US, “rooted in religious principles” believed to derive from the Judeo-Christian God of individual freedom—a conception of Deity antithetical to Islam’s ruthlessly autocratic Allah. …[T]he United States [is] a strongly religious country that proudly proclaims itself “one nation under God,” as the U.S. Pledge of Allegiance says. This God is the Judeo-Christian God. “Our Saviour…has taught us to judge the tree by its fruit,” Thomas Jefferson, America’s third president, wrote to Martin Van Buren, America’s eight president. That is precisely what we should do with regard to Islam, which constitutes the greatest political threat facing the West today. Many people underestimate this threat. Some do not see it at all, believing Islam is merely a religion like any other. The threat, however, is political, because Islam seeks to exert totalitarian control over every aspect of life. Islam claims it all: God’s part, but also Caesar’s. Ultimately, although not uncritical of the West, Wilders is unabashed in his conviction that the values of Western societies are superior, and merit steadfast defense. Defenders of Western civilization, whether religious or not, should unite protecting our way of life. The criticism of our traditional culture that permeates Western society today is disproportionate and self-destructive. No doubt Judeo-Christian civilization is imperfect, but it’s unfair to denounce its faults in a historical vacuum. When you compare the West to any other culture that exists today, it becomes clear that we are the most pluralistic, humane, democratic, charitable culture on earth. As a logical corollary to his Weltanschauung, reinforced by numerous visits to Israel, Wilders is an openly avowed, vigorous supporter of the Jewish State. Wilders has argued without apologetics that Israel is the only country in the Middle East which shares the West’s Judeo-Christian identity, and values. Furthermore, Wilders understands and eloquently articulates the doctrinal and historical realities—rooted in Islam’s timeless institution of jihad war against non-Muslims—which are responsible for Israel’s predicament. Israel is simply in the way of the Islamic advance. Just like West-Berlin was during the Cold War. Israel is simply receiving the blows that are meant for all of us. If there would have been no Israel, Islamic imperialism would have found other places to release its energy and its desire for conquest. Therefore, the war against Israel is not a war against Israel. It is a war against the West. It is jihad. …But is Israel guilty of the plight of the Palestinian refugees? My answer is “No.” The Arab leaders are to be blamed – and Islam is to be blamed. We must speak the truth. The truth that Jordan is Palestine, the truth that Samaria and Judea are part of Israel, the truth that Jerusalem may not fall, the truth that Israel is the only democracy in a dark and tyrannical region, the truth that Israel is the linchpin of the West. These unpardonable sins against the Eurabian order—his staunch defense of Western exceptionalism, and concordant vocal support for Israel—have precipitated incessant rhetorical, legal, and even threatened lethal assaults directed at Wilders by the Muslim and non-Muslim avatars of Eurabia. Well before the controversy erupted surrounding Wilders’ brief documentary film “Fitna,” and even prior to the killing of Dutch filmmaker Theo Van Gogh in November, 2004, Wilders, in September, 2003, received a death threat for requesting that the Dutch government investigate a mosque (in the city of Eindhoven, some 80 miles southeast of Amsterdam) suspected of fomenting Islamic jihadism. Additional death threats accrued over the next year—explicit calls for his decapitation—when Wilders abandoned the VVD Party because of its support for Turkey’s entry into the European Union. Meanwhile, the international media reported that Ayaan and I, two “anti-Muslim politicians,” had “gone into hiding after death threats.” They portrayed us as having run away like cowards, shunning responsibility for our alleged hatred of Muslims. In reality, we found ourselves practically imprisoned in our country for the mere fact that we had spoken out against enemies of the West. Unlike Kurt Westergaard, I was never chased around my home by an axe-wielding Islamic fanatic. However, I do live with this kind of threat every day, which is why, like Westergaard, I have a panic room in my house, where I am supposed to take refuge if one of the adherents of the “religion of peace” makes it past my permanent security detail and into my home. In fact, it’s not really my home at all—I live in a government safe house, heavily protected and bulletproof. Since November 2004, when a Muslim murdered Dutch filmmaker Theo Van Gogh for the crime of offending Islam, I have been surrounded by police guards and stripped of nearly all personal privacy. I am driven every day from the safe house to my office in the Dutch Parliament building in armored police cars with sirens and flashing blue lights. I wear a bulletproof jacket when I speak in public. Always surrounded by plainclothes police officers, I have not walked the streets on my own in more than seven years. …Why do I need this protection? I am not a president or a king; I am a mere member of the Dutch Parliament, one of 150 elected parliamentarians in the Tweede Kamer, the House of Representatives of the Netherlands, a small country of 16.5 million in Western Europe. However, I have joined Westergaard in a rapidly growing group of individuals throughout the world who have been marked for death for criticizing Islam. For asserting our rights to say what we really think about this political ideology that disguises itself as a religion, we have been hounded by Muslims seeking to make an example of us. Offend us, they are saying to the world, and you will end up in hiding like Wilders, attacked like Westergaard, or dead like van Gogh. …over and over [Schalken] steered the conversation towards the Wilders trial… to convince me of the correctness of his [Schalken’s] decision to drag Wilders to court. The court acquitted me because I had criticized Islam, not Muslims, and because, as an elected politician participating in a public debate, I was entitled to greater freedom of speech than everyday citizens. Today, not a single Christian will tell you that the Inquisition was acceptable. But not a single Muslim will dare to say publicly that sharia is unacceptable. Barreau admonished Islamic scholars and the Muslim intelligentsia to repudiate the totalitarian Sharia, specifically, its draconian “hadd” punishments: lethal penalties for “apostasy” and adultery—the latter applied disproportionately to women, and mutilating limb amputations for theft. The analyses of G.-H. Bousquet (d. 1978), a preeminent 20th century of Islamic Law, explain why Barreau’s urgent admonition—although it should have been heeded long ago—continues to be ignored by mainstream, institutional Islam. Bousquet, in his seminal L’Ethique sexuelle de l’Islam (“The Sexual Ethics of Islam”), highlighted the “doubly totalitarian” nature of Islam—its eternal quest to impose a universal ruling order by jihad warfare—and the permanently stunted “evolution” of that “order”, i.e., Islamic Law, the Sharia. Islam’s Sharia, Bousquet argued, is analogous to the undifferentiated cloaca (i.e., in zoological anatomy, the posterior orifice that serves as the joint opening for both the intestinal and urinary tracts of certain animal species), which accounts for it being a “casuistic hodegepodge.” Bousquet saw the Sharia’s emergence as a retrogressive development—compared to the evolution of clear distinctions between “ritual, the law, moral doctrine, good customs in society, etc.,” within Western European Christendom—which was utterly incompatible with modern Western conceptions of universal, individual human rights. Marked for Death demonstrates that Geert Wilders fully grasps Bousquet’s elaboration of Islam’s doubly totalitarian essence. Moreover, Wilders is inspired by great Western statesmen of the past two centuries, who similarly possessed his unexpurgated knowledge of Islam, and the threat of jihadism. These political leaders include: John Adams and Thomas Jefferson who confronted North African jihad piracy in the late 18th and early 19th centuries; John Quincy Adams and Theodore Roosevelt, who recognized and denounced the mass murderous Ottoman jihad depredations against indigenous, pre-Islamic Christian populations in the Balkans and Asia Minor, during the 19th and early 20th centuries; Alexis de Tocqueville, who made a detailed study of the Koranic invocations for jihad war before serving as a diplomat in Algeria in the mid- 19th century; and Winston Churchill, who as a young British officer, fought the fanatical jihadist followers of the Sudanese Mahdi, at the end of the 19th century. …political indoctrination of our children and proudly begin teaching them the real history of the West instead of multiculturalist lies designed to instill shame in our own heritage. We must also prepare the coming generation for the difficult times ahead by explaining Islam’s true, bloody history. …stop pretending that Islam is merely a religion—it is primarily a totalitarian ideology that aims to conquer the West. A free society should not grant freedom to those who want to destroy it. Wilders conjoins these domestic recommendations to a demand that the West confront intolerant Islamic regimes. They [Islamic regimes] should recognize that human rights exist to protect individuals, not religions and ideologies. Member states of the Organization of Islamic Cooperation that do not denounce the Cairo Declaration [the Orwellian Universal Declaration of Human Rights in Islam], which elevates Sharia law over human rights, should be expelled from the United Nations. Until this happens, Western nations should refuse to make any financial contributions to the UN…Western countries should cut all development aid to OIC members that adhere to the Cairo Declaration and minimize bilateral relations. Wilders further admonishes Western and global non-Muslim solidarity against the worldwide depredations of jihad. Since Islam has global ambitions, we are all in danger, and we should stand with every nation and every people that is threatened by jihad. This includes Israel, the only democracy in the Middle East. We should recognize that the Israelis’ conflict with the Palestinians is not about land; it is an ideological conflict between freedom and tyranny. We must also stand with all the oppressed non-Muslim groups suffering in silence throughout the Islamic world—the Christians, Zoroastrians, animists, and secularists in nations like Egypt, Iran, the Sudan, Nigeria, Indonesia, and elsewhere. During late 2010, an alarming comment by senior Dutch politician and former EU commissioner Frits Bolkestein was released publicly, excerpted from Manfred Gerstenfeld’s study “The Decay: Jews in a Rudderless Netherlands.” Acknowledging the virulent Islamic Jew-hatred of Moroccan (and Turkish) Muslim immigrants to the Netherlands, and the Dutch government’s inability to combat this scourge, Bolkestein suggested that “recognizable Jews” advise their children to emigrate to Israel or the United States. I see no future for recognizable Jews, in particular because of anti-Semitism, specifically in Dutch Moroccans, who continue to grow in number…I foresee no quick solution, and anti-Semitism will continue to exist. Moroccan and Turkish young people won’t care about the measures [i.e., to combat such Jew-hatred by the Dutch government]. Jews shouldn’t emigrate, Antisemitic Moroccans should. His reaction was consistent with Wilders’ eminently reasonable views on the assimilation of Muslim immigrants. The message to all newcomers in our societies should be clear: if you subscribe to our laws and values, you are welcome to stay and enjoy all the rights our society guarantees; we will even help you to assimilate. But if you commit crimes, act against our laws, or wage jihad, you will be expelled. Free men and women everywhere must resist this violent intimidation at all costs. Armed only with our pens, we must defy Islam’s axes and knives. We must continue to speak our minds, knowing there is nothing more powerful than the truth. This is why we write our books and speeches, draw our cartoons, and make our movies and documentaries. The truth will set us free. That is what we really believe. Geert Wilders—informed, honest, and hopeful—has emerged as a uniquely courageous champion of Western freedom versus Islamic totalitarianism.